Flashback: Cheltenian wins the Weatherbys Champion Bumper at Cheltenham. Racegoers at Doncaster this afternoon are in for a treat when 2011 Cheltenham Bumper winner Cheltenian takes on last season’s Supreme Novices’ Hurdle runner-up Josses Hill over fences. The Philip Hobbs-trained Cheltenian has suffered with injuries since he was successful at the Cheltenham Festival and only won one of his seven starts over hurdles. 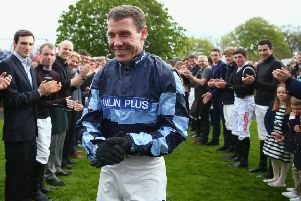 He turns his attentions to chasing rather late in life at nine, but jockey Richard Johnson has been delighted with his schooling at home ahead of the Betdaq Zero Per Cent Multiples For First Month Novices’ Chase. “He’s obviously a Champion Bumper winner and, unfortunately, had to have the year off after that,” Johnson told At The Races. “I schooled him on Saturday and he felt really well and Doncaster should be the ideal place for him to start. “He showed he was up to a decent level over hurdles and I’m hoping something wasn’t quite 100 per cent last spring and he should be a top-class novice chaser this season. Josses Hill recently made his chasing debut at Ascot, where he was a beaten odds-on favourite behind Ptit Zig, who won so well at Cheltenham on New Year’s Day. “It’s lovely ground, and that is the main reason why we are going,” said trainer Nicky Henderson. “It’s a good race, though, so it looks like everyone is in the same boat. “Because of his splint problem he wasn’t as fit as some of the others last time out so I expect him to come on a good deal for that run at Ascot.